I love walking. I am not the fittest person in the world but I enjoy walking in nature and enjoying it. When it is too cold or the weather is horrible I use to walk on my treadmill facing the window taking in the breeze. Forget about watching tv or a stimulation. Looking out the window was my tv and brain stimulation as if I was going somewhere. Two years ago I decided I would like a gym membership. I ofcourse went on the treadmill as one of my work out while I was there. But I also tried out the cross trainer and loved it! I learn that the cross trainer can burn more calorie in half of the time compare walking on a treadmill. I could jog but more in a control environment instead of jogging to fast or too slow getting tired faster than usual. So okay good think about treadmills are that you can walk with weights in your hands, do arms workout, and even dance as you walk. I done it many times. This is what you can’t do on a cross trainer. Both has it good points some higher than the other. At the moment I an enjoying my cross trainer and lost 12lbs in 7 days with eating right and exercising 6 days a week. Yesterday I surprise myself and jog for 21 minutes to 1.3 miles. I have not done that in years! I still have a lot to go and I will use my cross trainer to help me with that goal. On good days when the weather is beautiful I will go for a long walk like today for 2.5 hours. Good for you! I bet you feel better too. My treadmill is at my brothers house, I don’t have the room for it. So, out of sight, out of use! Some day I may shape up and get in better shape. I did, I totally surprise myself. Harold you are beautiful the way you are. I would not change anything about you, but when it does come to health shape up I so agree on. You don’t need a machine to enjoy nature every once in a while. Hi Bearrunner and thanks for reading my post. I see why, treadmill is great for marathon training when not being able to run outside. 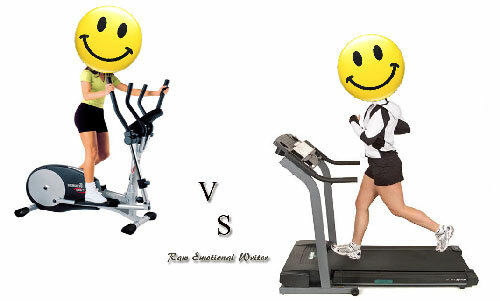 I think the treadmill can be a great fitness too because it is measurable. You can track how far you go an dhow much energy you use to get there. when I have 20 or 30 minutes I use the calorie counter as a gauge for how hard I worked (pace x distance = calories burned) And so I try to burn more calories, as a benchmark for my fitness. I have used it to increase my speed in 5k’s by keep hiking up the rate every two minutes or for marathon training, like you said. its a great tool if you use it for one! When you walk do you raise the incline a bit? Hi Our Live in 3D and thank you. I think your result is better than mines:) I almost forgot about that…about how treadmills can be elevated for stimulation as hiking or climbing Seattle up hill sidewalk. I just got tired picturing those side walk, lol. I have not use any of the function as yet. I am working on building my stamina up again. I been on a vacation lazy wise for too long just doing minimal that I been catching myself losing breath easily. Sometime I am faking it as looking at something when I am merely trying to get a breather in. So far I am walking with ease again which I am truly happy for. I think the more I work on the cross trainer I will slowly work my way into some of the settings. Yeah the first muscle you have to get back in shape is your heart muscle. I actually did a post last week on that in my ‘Family Fitness posts. It just takes time. Treadmills can help you push yourself by setting benchmarks in ‘Pace’ and then gradually increasing them as you feel more comfortable at a certain level. Set a new goal to attain at the beginning of the week, whether in pace or time, and achieve it, then move on to a new goal the following week. that’s what I do. Good Luck!